Virgin Australia today announced that construction has begun at Melbourne Airport’s Terminal 3 (T3), signalling the commencement of the airline’s comprehensive redevelopment of its domestic terminal announced in December. From today, Virgin Australia’s check-in kiosks will gradually be replaced and installed with new software, allowing passengers to quickly check-in, print boarding passes and baggage tags. New service pods and service desks will also be installed. By the end of the year, the majority of the automatic bag drop facilities will be implemented, significantly reducing congestion and allowing passengers to quickly move through the check-in and bag drop process. Virgin Australia Airlines Group Executive, Rob Sharp said: “Melbourne is one of our busiest hubs with over 100 return flights operating each day, and it’s imperative we have the infrastructure to support that. We also want to move our Ground Crew into more of a concierge-style role, where they are brought out from behind counters and are able to better assist the needs of our passengers. “We’re taking a phased approach to construction, so proactive communications will be sent to all passengers travelling during those periods advising that it’s best to check-in online via the website or the Virgin Australia App, and to arrive at least 60 minutes prior to their flight departure. “There will also be extra ground crew stationed in the check-in hall over the next few months to assist passengers with the process if they require,” Mr Sharp said. 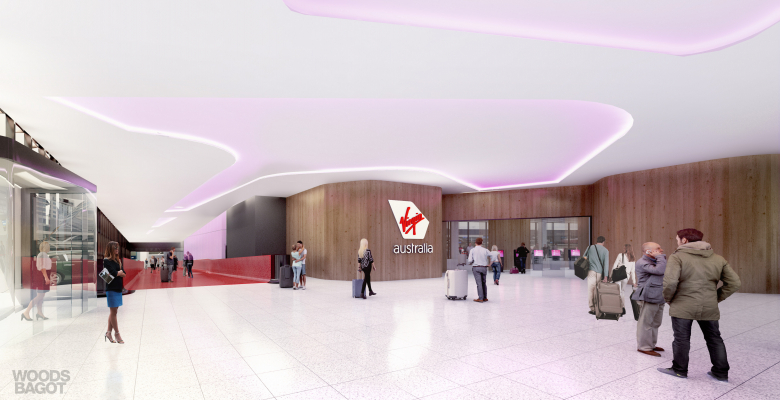 Melbourne Airport Chief of Aviation, Simon Gandy said: “We’re excited to commence the works on the new guest experience that Virgin Australia will bring to Terminal 3. “This is an instrumental project that will streamline and dramatically enhance the check-in experience for Virgin Australia’s guests flying from T3. It marks the commencement of the broader development plans we have with Virgin Australia for Terminal 3 and importantly, it integrates with the wider development works underway throughout the airport. We are forecasting a record-breaking Christmas and New Year period so it will be great to have this new experience in place ahead of this. “We’ll be working closely with Virgin Australia to help ensure the guest experience is maintained throughout the construction period, with additional resources supporting security screening and our team of customer service volunteers on hand throughout the terminal,” Mr Gandy said. The majority of the construction at Virgin Australia’s check-in facilities is scheduled to be completed prior to Christmas 2018.